"PVG" redirects here. For other uses, see PVG (disambiguation). Shanghai Pudong International Airport (IATA: PVG, ICAO: ZSPD) is one of two international airports of Shanghai and a major aviation hub of China. Pudong Airport mainly serves international flights, while the city's other major airport Shanghai Hongqiao International Airport mainly serves domestic and regional flights. Located about 30 kilometres (19 mi) east of the city center, Pudong Airport occupies a 40-square-kilometre (10,000-acre) site adjacent to the coastline in eastern Pudong. The airport is operated by Shanghai Airport Authority (Chinese: 上海机场集团公司, SSE: 600009). Pudong Airport has two main passenger terminals, flanked on both sides by four operational parallel runways. A third passenger terminal has been planned since 2015, in addition to a satellite terminal and two additional runways, which will raise its annual capacity from 60 million passengers to 80 million, along with the ability to handle six million tons of freight. Pudong Airport is a fast-growing hub for both passenger and cargo traffic. With 3,703,431 metric tons handled in 2017, the airport is the world's third-busiest airport by cargo traffic. Pudong Airport also served a total of 70,001,237 passengers in 2017, making it the second-busiest airport in China, fifth-busiest in Asia, and the ninth-busiest in the world. It is also the busiest international gateway of mainland China, with 35.25 million international passengers. By the end of 2016, Pudong Airport hosted 104 airlines serving more than 210 destinations. Shanghai Pudong is the busiest international hub of China, and about half of its total passenger traffic is international. Pudong Airport is connected to Shanghai Hongqiao Airport by Shanghai Metro Line 2 and the Shanghai Maglev Train via Pudong International Airport Station. There are also airport buses connecting it with the rest of the city. Prior to the establishment of Pudong International Airport, Shanghai Hongqiao International Airport was the primary airport of Shanghai. During the 1990s, the expansion of Hongqiao Airport to meet growing demand became impossible as the surrounding urban area was developing significantly, and an alternative to assume all international flights had to be sought. After deliberation, the municipal government decided to adopt the suggestion from Professor Chen Jiyu of East China Normal University, who wrote a letter to the Mayor of Shanghai Xu Kuangdi suggesting that the new airport should be constructed on the tidal flats of the south bank of the Yangtze River estuary, on the coast of the Pudong development zone to the east of Shanghai. Construction of the first phase of the new Shanghai Pudong International Airport began in October 1997, took two years to build at a cost of RMB 12 billion (1.67 billion USD), and was opened on October 1, 1999 It covers an area of 40 square kilometres (15 sq mi) and is 30 kilometres (19 mi) from downtown Shanghai. The first phase of the airport has one 4E category runway (4000 m x 60 m) along with two parallel taxiways, an 800,000-square-metre (8,600,000 sq ft) apron, seventy-six aircraft positions and a 50,000 m2 (540,000 sq ft) cargo warehouse. In November 2011, Pudong Airport received approval from the national government for a new round of expansion which includes two runways. The 3,800-metre fourth runway, along with an auxiliary taxiway and traffic control facilities, is projected to cost 2.58 billion yuan (USD 403 million). The 3,400-metre fifth runway, along with a new traffic tower, will cost 4.65 billion yuan (USD 726.6 million). Construction was completed in 2015 and has doubled the capacity of the airport. Pudong International Airport officially started the third phase of the Pudong International Airport expansion with the construction on a new south satellite terminal on December 29, 2015. The new satellite terminal will be the world's largest single satellite terminal with a total construction area of 622,000 square meters, which is larger than the Pudong International Airport T2 terminal building (485,500 square meters). The satellite terminal is composed of two halls, S1 and S2, forming an H-shaped structure. It will have an annual design capacity of 38 million passengers, The total cost of the project is estimated to be about 20.6 billion yuan. Halls S1 and S2 will have 83 gates. A high capacity People mover connecting T1 to SI and T2 to S2 will be constructed. After the completion of the satellite terminal in 2019, Pudong International Airport will have an annual passenger capacity of 80 million passengers, ranking among the top ten airports in the world. The airport has 70 boarding bridges along with 218 parking positions. Five runways are parallel to the terminals (four operational): one 4,000-metre (13,000 ft) runway with 4E rating (capable of accommodating aircraft up to Boeing 747-400) , two 3,800-metre (12,500 ft) runways with 4F rating (capable of accommodating aircraft up to Airbus A380, Boeing 747-8, and Antonov An-225) , and two 3,400-metre (11,200 ft) runways with 4F rating . 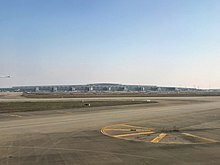 Pudong airport currently has 5 runways. Rwy 35L/17R and Rwy 34R/16L are mostly used for landing while Rwy 35R/17L and Rwy 34L/16R are mostly used for takeoff. Runway 15/33 is not in operation. Terminal 1 was opened on October 1, 1999 along with a 4000-metre runway and a cargo hub. It was built to handle the demand for traffic and to relieve Shanghai Hongqiao International Airport's traffic. The exterior of Terminal 1 is shaped like a seagull, and has 28 gates, 13 of which are double-decker gates. The capacity of Terminal 1 is 20 million passengers. It currently has 204 check-in counters, thirteen luggage conveying belts and covers an area of 280,000 square metres. The gates for Terminal 1 is 1–12, 14–29 (linked with jetway), while the remote gates are 201–211, 533–543, 115–117, 201–211, 251–255, 256–258, and 511–521. Terminal 2, opened on March 26, 2008, along with the third runway, gives a capacity of 60 million passengers and 4.2 million tons of cargo annually. Terminal 2 is shaped like Terminal 1, although it more closely resembles a wave, and is slightly larger than Terminal 1. Terminal 2 also has more levels than Terminal 1. Terminal 2 is primarily used by Air China and other Star Alliance members. The gates for Terminal 2 is 50–65, 67–79, 80–98 (Note that gates 58–90 is used by both the C gates (used for domestic flights) and the D gates (used for international flights). The gates between gates 65–79 is only odd numbers (65, 67, 69, 71, 73, 75, 77, 79). Gates 50–57 and gates 92–98 is used for C gates only. The remote gates for Terminal 2 is 581–586, 589–590, 593–600, 801–816. An additional satellite concourse facility to provide further gates and terminal space started construction on December 29, 2015 and was expected to be completed in late 2018. This project will support 38 million passengers annually through 83 departure gates across two S1 and S2 concourses. These will be connected by an underground automated people mover to the current T1 and T2 terminals. It is now set to open in the second half of 2019. The airport has been using the Airport Collaborative Decision Making system (A-CDM) developed by the aviation data service company VariFlight since January 2017. The system is aimed to improve on-time performance and safety of the airport's operations. By June 2017, Shanghai Pudong airport recorded 62.7% punctuality rate, which was a 15% increase compared to the same period previous year. Starting service on January 29, 2004, as the first commercial high-speed maglev railway in the world, Shanghai Maglev Train links Pudong International Airport with Longyang Road Metro Station, where transfer to Line 2, Line 7, and Line 16 is possible. The 30 km (19 mi) ride from Longyang Road Metro station to Pudong International Airport typically takes less than eight minutes, with the maximum speed reaching 431 km/h (268 mph). Trains operate every 15 minutes; therefore passengers can expect to arrive in less than 25 minutes, waiting time included. All cars are equipped with racks and space designated for luggage. 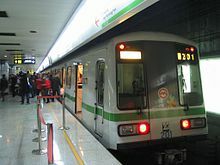 Shanghai Metro Line 2 also provides service between Pudong International Airport and Longyang Road, Lujiazui, People's Square, and Hongqiao International Airport, Shanghai's primary domestic airport as well as Shanghai Hongqiao Railway Station. Line 2 is part of the Shanghai Metro system; therefore unlike the Maglev, free in-system transfer to other lines are possible. Prices are substantially lower than the Maglev. A casual ride to People's Square, the city center, typically takes just over one hour. It is wise to allow more than five hours for a safe flight transfer at Hongqiao International Airport using public transportation. Line 2 operates in two sections: trains from Pudong International Airport terminate at Guanglan Road, where passengers wishing to travel on change trains across the platform. In addition, not all trains go to Hongqiao International Airport. The plan for building a new commuter railway line connecting the airport with Hongqiao Airport, Airport Link, has been formally established in 2015 and approved in December 2018 by National Development and Reform Commission. This railway starts from Shanghai East railway station under planning, via Disneyland, Zhangjiang and Sanlin in Pudong, Xujing in Xuhui and Qibao in Minhang. It will use the unused area in Hongqiao Railway Station originally for Maglev for its station at Hongqiao Transportation Hub. Eight airport bus lines serve the airport, providing rapid links to various destinations. On November 28, 2009, Avient Aviation Flight 324, an Avient Aviation McDonnell Douglas MD-11F cargo plane registered to Zimbabwe (registration: Z-BAV) departing for Kyrgyzstan crashed into a warehouse near the runway of the airport due to a tailstrike that caught fire during takeoff and broke into several pieces with seven people on board. Three people died and four were injured. The S1 Yingbin Expressway goes into the airport. ^ a b c 2017年民航机场生产统计公报 (in Chinese). Civil Aviation Administration of China. 2018-03-07. Retrieved 2018-03-15. Cite error: Invalid <ref> tag; name "stats2017" defined multiple times with different content (see the help page). ^ "UPS Air Operations Facts - UPS Pressroom". Archived from the original on 12 May 2015. Retrieved 1 June 2015. ^ "Deutsche Post DHL targets Asian expansion". Retrieved 1 June 2015. ^ Jian, Yang (January 28, 2015). "4th Pudong runway opens in March". Shanghai Daily. ^ Shanghai Airport reports profit growth, despite big investments in massive new facilities at Pudong – China Airlines, Airports and Aviation News. Chinaaviation.aero (2008-03-11). Retrieved on 2011-01-22. ^ "上海浦东机场口岸出入境人数首破3500万". www.chinanews.com (in Chinese). 2017-12-27. Retrieved 2018-12-18. ^ "From obscurity, Guangzhou and Shanghai Pudong airports move up rankings". CAPA. June 3, 2011. ^ "Shanghai Pudong's fourth and fifth runways receive approval". CAPA. 6 December 2011. ^ "Shanghai airport to double capacity". South China Morning Post. 8 December 2011. ^ 成昭远. "浦东机场三期扩建启动 世界最大单体卫星厅总面积超T2[图]-浦东,航站楼,上海,卫星,旅客,机位,厅,中转,机场,单体,-上海频道-东方网". sh.eastday.com. Retrieved 2018-11-04. ^ 万户网络设计制作. "上海机场(集团)有限公司". www.shanghaiairport.com (in Chinese). Retrieved 2018-11-04. ^ "Shanghai Pudong Airport starts construction world's largest satellite terminal". Shanghai Airport Authority. 2016-01-12. Retrieved 2016-05-01. ^ Coleman, Liam (3 September 2018). "Shanghai Pudong seeks retail partners for world's largest satellite terminal". dfnionline.com. Retrieved 23 February 2019. ^ 飞常准：用科技助力民航高效发展，推动智慧航旅服务升级. Soho. 2018-02-01. Retrieved 2018-04-17. ^ "Air China inaugurates Barcelona-Shanghai direct flight - Xinhua - English.news.cn". www.xinhuanet.com. Retrieved 23 February 2019. ^ "Cebu Pacific adds Cebu Shanghai Service". Routesonline. Retrieved 25 March 2019. ^ "Mactan airport opens door to new international flights". Retrieved 19 Oct 2017. ^ "Clark-Shanghai-Clark is back!". ph.ceair.com. Retrieved 23 February 2019. ^ Ltd. 2019, UBM (UK). "China Eastern adds Shanghai – Hanamaki service in late-Jan 2019". Routesonline. Retrieved 23 February 2019. ^ "嘿！2018年冬春新航季，来聊点航线新动态！". qq.com. Retrieved 23 February 2019. ^ "新航线 · 井冈山￥360起 ▎1月18日起，东航新开【昆明-井冈山-上海浦东】航线！". qq.com. Retrieved 23 February 2019. ^ "China Eastern adds Shanghai – London Gatwick service from Dec 2018". routesonline. Retrieved 5 August 2018. ^ "China Eastern plans Shanghai – Mandalay launch in Jan 2019". routesonline. Retrieved 14 December 2018. ^ a b 出行又添新选择 东航云南3月底将新开11条航线]. 163.com news. 2018-03-02. ^ "China Eastern adds Shanghai – Yangon service from June 2019". routesonline. Retrieved 11 April 2019. ^ "China Eastern plans Stockholm launch in June 2018". Retrieved 3 Mar 2018. ^ 2017, UBM (UK) Ltd. "Hainan Airlines plans Shanghai – Brussels resumption in Sep 2017". routesonline.com. ^ airlineroute (28 May 2017). "From Shanghai Pu Dong, Hainan Airlines to operate 3 weekly flights each to Tel Aviv from 12 September 2017, Brussels from 25 October 17". twitter. ^ "Hainan Airlines to launch Tel Aviv-Shanghai flights". globes. Retrieved 2017-05-29. ^ "Juneyao Airlines schedules Helsinki launch in late-June 2019". Retrieved 4 February 2018. ^ Ltd. 2019, UBM (UK). "Shanghai Airlines adds Shanghai Pu Dong – Macau from March 2018". Routesonline. Retrieved 23 February 2019. ^ "Thai Lion Air expands scheduled service to China from Nov 2017". routesonline. Retrieved 29 January 2018. ^ 2017, UBM (UK) Ltd. "Vietnam Airlines S17 Phu Quoc – Shanghai service changes as of 12MAY17". routesonline.com. ^ GmbH, DVV Media Group. "Air China Cargo lands at Liege Airport ǀ Air Cargo News". www.aircargonews.net. ^ "China Cargo Airlines begins cargo flights between Shanghai-Pudong and Frankfurt". www.ajot.com. Retrieved 23 February 2019. ^ "2007年全国机场吞吐量排名". Civil Aviation Administration of China. 6 March 2008. Archived from the original on 2017-10-07. Retrieved 2017-10-08. ^ a b "2008年全国机场吞吐量排名". Civil Aviation Administration of China. 12 March 2009. Archived from the original on 24 May 2011. Retrieved 29 March 2011. ^ "2009年全国机场吞吐量排名". Civil Aviation Administration of China. 5 February 2010. Archived from the original on 18 July 2011. Retrieved 29 March 2011. ^ "2010年全国机场吞吐量排名". Civil Aviation Administration of China. 15 March 2011. Archived from the original on 23 September 2011. Retrieved 29 March 2011. ^ 2012年全国机场吞吐量排名 (in Chinese). Civil Aviation Administration of China. 28 March 2013. Archived from the original on 7 October 2017. Retrieved 8 October 2017. ^ 2016年民航机场生产统计公报. CAAC. 24 Feb 2017. ^ Cargo plane crashes at Shanghai airport – Xinhua. Reuters. Retrieved on 2011-01-22. ^ 浦东机场货机坠毁现场浓烟滚滚. Sina. Retrieved on 2011-01-22. ^ "3 Americans killed in Shanghai plane crash". Retrieved 1 June 2015. 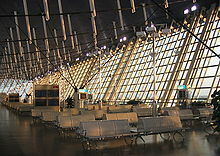 Wikimedia Commons has media related to Shanghai Pudong International Airport. Wikivoyage has a travel guide for Shanghai Pudong International Airport.